*There will be “the insect instalation” at 10am to 7pm on 10 and 12 October. • Send an application with all name of applicants to info@kare-san-sui.com for reservation. In Japan there was “Insect Listening Party” as a local custom like Hanami (flower viewing party) or Tsukimi (moon viewing party) since long time ago. However it is hard to see such “Insect Listening Party” today. Then we would like to bring it back to the center of Tokyo. 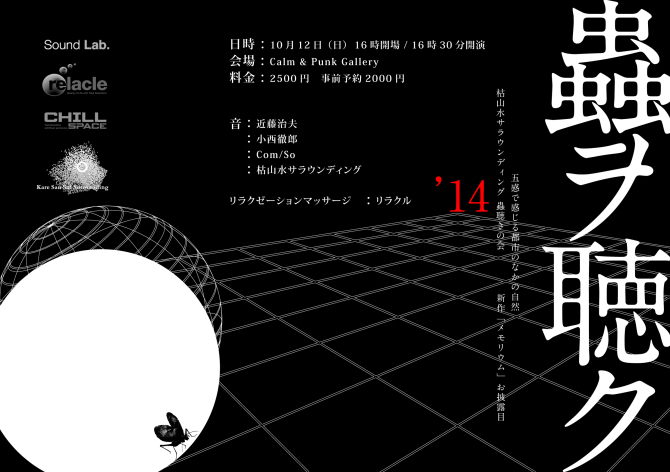 The venue of this year is” Calm & Punk Gallery “. It is very cool and experimental gallery in Nishi Azabu. And we will launch our new sound installation system named “memorieum ”. Then we will bring real insects “Suzumushi” into the venue and picking the sound of chirping by a skillful sound designer Haruo Okada from “Pioneer Sound Lab.”. We Kare-San-Sui Surrounding will play it with realtime digital processing. And also various and skillful guest artists will have live performances with it. Preparing aroma relaxation by “Relacle”, We look forward to see you again.